At our November Ward 30 Bikes monthly general meeting it was decided we needed to take all the ideas on the “CycleTO Ward 30 Bikes: Problems/Opportunities” Map (http://goo.gl/maps/Musw4) and turn them into an easy to read list. ‘Neck-Downs’ on Pape at Riverdale Ave.
Paul Young of South Riverdale Community Health Centre, Ward 30 Councillor Fletcher, in conjunction with local residents and parents of children at nearby schools, got a ‘neck-down’ installed on Pape in the south-bound curb lane leading down to the turn onto Riverdale Ave., west-bound. It is hoped the measure will slow car traffic around this corner. A couple of years ago through a similar exercise, residents got the south west corner sidewalk widened also; and now that place has trees, and only one traffic lane southbound on Pape south of Riverdale Ave., slows traffic there also. The intersection was a hazard for pedestrians (and cyclists) – most of whom are students attending one or the other of the two nearby schools: Pape Avenue Junior Public School (just to the south) and the East Alternative School of Toronto (just east on Riverdale at Kiswick). Needed to collect east west corridors that need to funnel down to Dundas Separated Bike Lanes – connecting to River and then to Adelaide/Richmond separated bicycle corridor. At Dundas and River, existing infrastructure encourages Westbound cyclists to take River Street Bike lanes North or South (depending on your destination). North to Gerrard to get to the Young/Bloor area; or South to Shuter Street and into the Downtown core. Eastbound on Dundas, the left turn lane (South onto River St.) needs a Bike Box. River and Gerrard – needs a left-turn Bike Box on River at Gerrard to make the left turn onto Westbound Gerrard. The Lower West Don Redevelopment plans to create a tunnel under the Rail lands just North of here – to connect the new neighbourhood to the Port Lands. Right now, Cherry Street across Lake Shore Blvd. is hell on two wells. Connect Lower Don Rec. Trail to Broadview Ave.
Fly-Over Bridge creates a cycle corridor from Withrow Park at Danforth, to Unwin Ave. Tommy Thompson Park. Add Bike Lanes to the Port Lands Streets. The rail track underpass over to Broadview Ave. – the school at Boulton and generally along here – lots of stopped and parked vehicles using the Bike Lane as parking spots. Good reason for Separated Bicycle Lanes on Dundas? Lots of construction along here right now – but also lots of stopping and parking in the Westerly Bike Lanes for deliveries and visiting to the Artists Spaces on the south side of Dundas – stopping and parking on the North side too. Connects the Dundas Street Bike Lanes to an the street grid East of Kingston Rd. Railway Tracks across the Lower Don Rec. Trail are dangerous. Paul says he fell there this week (and has the big bruise on his hip and a raspberry on his elbow to prove it 🙂 — a year ago his young daughter fell at the same spot. Is this rail line even in use? Can we remove these tracks? Bike Boxes needed east bound on Queen left-turn up Greenwood. South bound on Greenwood left-turn Bike Box for turning East bound onto Queen. Bike Boxes needed east bound on Queen left-turn up Jones. South bound on Jones left-turn Bike Box for turning East bound onto Queen. Eastern Ave East bound, left-turn Bike Box to turn North onto Leslie St. Cycle Track along the west boundary of the Loblaws Parking Lot – in order to connect Martin Goodman Trail North across Lake Shore Blvd. 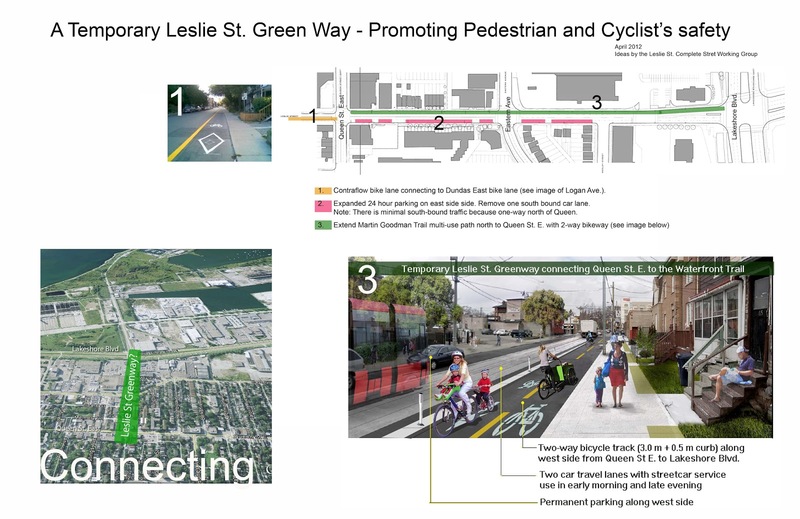 “A temporary Leslie Street Green Way – Promoting Pedestrian and Cyclist’s Safety” – a proposal by The Leslie Street Complete Streets Working Group (2011-12) to create a Gateway to the Portlands along Leslie Street – image by The Leslie St Complete Street working Group (illustration, Paul Young). Speed bumps of any pitch on a parks’ multi-use trail are anathema to cycling culture. The car-only design of the parking lot needs to incorporate the Bike Lane meme. As it is, it discourages local residents from using their bicycles to do their shopping. Bicycle Lock-ups are of bad design, ugly, old, and too few. I counted 5 lock-up spots on Price Choppers property. The City has 10 spots on the walkway connecting the Lower Don Trail to the Parking Lot walkway (the only safe way in for pedestrians). Bicycle Lock-ups are of bad design, ugly, old, and too few. I counted 20 lockups for bikes divided between the North and South entrances. Greg Burrell of Ward32Spokes wrote in this route – it hinges on the Dixon Ave Contra-Flow Bike Lane off the end of the Dundas Bike Lanes. Greg Burrell of Ward32Spokes ‘wrote-in’ this route – it extends the already marked bike route down Woodmount Ave (that runs all the way up to O’Connor ) south of the Danforth and West over to the Greenwood Bike Lanes. City of Toronto Transportation’s Cycling Infrastructure and Programs Unit upgraded this tunnel. Carlaw north of Riverdale acts is the south-bound equivalent to the northbound bike lane on Logan. However, when it hits Riverdale it becomes a wide, unpleasant street that gets even worse after Gerrard. This creates a big gap in the Ward 30 cycle network. It needs a bike lane at least to Gerrard and maybe to Dundas, and then a signed route over to the Logan lane (2-way south of Gerrard). Motorists turning right onto Lakeshore are often looking to their left (east) as they turn and are completely unaware of cyclists approaching from the West on the lower don recreation trail and fail to yield. Some also stop over the trail while waiting to turn. The trail should be better marked over intersections with clear signs for motorists to not only be aware but to yield. Separated Bike Lanes on Kingston Road Please. Harris Silver – at City of Toronto Cycling Facebook Group – posted about his accident here and proposes Bike Boxes – especially on Greenwood Southbound lanes at Gerrard. I see people cycling the wrong way southbound on Logan or northbound on Carlaw. Or cycling on the sidewalks running north-south along Withrow Park. We have an east-west multi-use path through the park. Suggestion: Create north-south multi-use paths on both sides of the park. And another east-west multi-use path at the south end. Next Post C.I.P. wants to know YOUR Suggested On-street Routes and Informal Connections! Want To Boost Your ClickBank Commissions And Traffic?Bannerizer made it easy for you to promote ClickBank products by banners, simply visit Bannerizer, and get the banner codes for your picked ClickBank products or use the Universal ClickBank Banner Rotator Tool to promote all of the available ClickBank products.